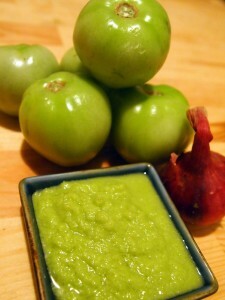 This is a recipe is the love child between tomatillo salsa and Peruvian Aji Verde. You can serve it like a Peruvian Aji to add heat and flavor to any dish but it is also mild enough to consume in larger quantities with chips like a typical Tex-Mex salsa. Combine ingredients in a high-speed blender until thoroughly processed.